I am dismayed at the statement issued by Tom Watson announcing his withdrawal from talks aimed at resolving the crisis in the Labour Party. Extraordinarily I received no notice of this statement before it was issued. I had made arrangements for a meeting of trade union leaders, Tom Watson and representatives of the PLP and the Party Leader for tomorrow, arrangements requested by Tom Watson and his colleagues, specifically for Mr Watson’s convenience. In that context, when the possibility of a workable plan had never seemed closer, Tom Watson’s actions today can only look like an act of sabotage fraught with peril for the future of the Labour Party. I must clarify one point in Tom Watson’s statement – I made it absolutely clear from the outset of these discussions that Jeremy Corbyn’s resignation as the Leader was not on the agenda. Mr Watson knew that, and it is entirely wrong to suggest that any public statement by Jeremy represented any change in the situation. This is a deeply disingenuous manoeuvre. I will continue to work with trade union colleagues and others to chart a way forward, including meeting the legitimate concerns of Labour MPs. Should there have to be a leadership election, I must warn that any attempts to keep Jeremy Corbyn, elected just ten months ago with an enormous mandate, off the ballot paper by legal means risks a lasting division in the Party. It is time for everyone to commit to a democratic and dignified procedure as the only way to avert such a disaster for working people. The right don’t care about anything other than control of the Party. So I for one will not be shocked if they try to keep Corbyn from the ballot. My guess is this is one of the reasons for haste, in the hope that the NEC will take the view that Corbyn needs to be nominated by MP’s as the position of the left is likely to be stronger after the elections next week. However, if they kept Corbyn from the ballot then the left splitting away is a possibility. Be afraid people. Any ideas what we could do? The rule specifying requirements for nominations for a Leadership election where there is no vacancy is unambiguous. There is no threshold specified for the incumbent. The only requirement is that challengers should be nominated by 20% of the PLP. To claim that Jeremy Corbyn requires nomination is making up requirements that are not in the rules. My agenda is to prevent the left splitting off from the Labour Party. We all know what happened to the ILP and if the media and structures stay with the renegade MP’s and the ‘Labour’ party (without a soul) we will struggle. It might turn out like Syriza, but that’s too big a gamble for me, we stand a way better chance if we have the Party. So, somebody tell me the problems with this idea. In the CLP’s that support Corbyn, where there is a Labour MP, have the CLP mandate the MP to nominate Corbyn under the threat of an attempt by the CLP to deselection if they refuse. Some will buckle and agree, perhaps enough to get Corbyn on to the ballot paper. If they don’t nominate and Corbyn doesn’t have enough to get on to the ballot paper then the process of deselection means getting the affiliated associations in the CLP to agree. At this point we ask the trade union leaders to put their money where their mouth is and support the deselections to avoid a split. I have no idea how many MP’s would be deselected, but if the campaign is successful, no matter how long it takes, as the number of Labour MP’s in the PLP dwindle it should reach the point where Corbyn will have the requisite number of nominations to launch a fresh leadership bid. Alternatively, can we use conference in some way? The influx of members appear to be pro Corbyn so we ought to be able to muster up resolutions that can help us whilst the energy is high. Experience tells me that this is difficult, but the influx of new people could work in our favour. Any thoughts would be much appreciated for I seriously believe this is what we face on Monday, just as McTernan predicted. You are falling into the age old trap of the Labour Left – of actually accommodating to the ruthlessness of the Right – and accepting it’s “back to business as usual” for the Labour Left – endless , useless, manoeuvering in branches and CLPs and resolution mongering at Conference to a deaf newly restored Right leadership. Sorry Richard, if the Right win this one, the “Corbynite Surge” will simply flood out of the Party en masse – to the Greens and potentially to any credible new Left Party which has the support of key trades unions . No-one but the old stagers of the Labour Left have any patience for all that tiresome , futile, “reform from within” nonsense. If the flukey 2015 Corbyn Leadership “insurgency” is seen off by procedural chicanery it is time to link up with the trades union movement to form a new Anti austerity Party of the reformist Left, not waste time trying to reanimate what will be seen by everyone but the old Labour Left as a corrupt Party beyond saving..
Perhaps, but you would say that wouldn’t you. As I recall you went for left unity, but they were proven wrong by recent events, just as those who went with the majority when militant split were proven wrong. What I am looking for, and you failed to provide was an action. Yours was piss off and give up. Not helpful. For the coup to have any chance if succeeding they need to keep Corbyn off the ballot by claiming that he has to comply with the nomination requirements for challengers. If they can’t they lose. Can anybody tell me why it seems to accepted that the coup will get away with this obvious misreading of the rules? I really can’t imagine the Left splitting. I highly doubt Jeremy, John, Diane et al. would leave the Labour Party unless expelled. Surely they would have done so years ago if they were willing. Given that, there would be nothing around which to build a new party and presumably it would go the way of previous experiments. I thinkg the more likely outcome should the right win an election through dirty dealings would be mass desertion by the membership, probably putting the party in an even more hollowed-out state than it was at the time of the last general election. The one uncertainty in all of this is what some of the more Left-wing unions would do. Presumably the FBU would disaffiliate again. Unite might end up disaffiliating to. Were that to happen, then there might be some small chance that a new Left party would be established, although whether it would be viable is another story. Yes, the entire strategy of the plotters , if the bullying of Jeremy to resign failed, as it ignominiously did, , must be to “go for broke” and try to keep Jeremy off the ballot. It’s a “bringing down the entire temple” act of extraordinary hubris by the Right – but for them and their billionaire backers the stakes are that high – to prevent a Corbynite Left Labour Party becoming the focus for the entire anti austerity struggle in the UK – and a beacon across Europe. The Labour Right don’t think they need a mass membership anyway – and extraordinarily foolishly don’t seem to want the trades unions (even that previous bulwark of Labour “moderation” – the trades union bureaucracy) on board either ! They just want to be like the US Democrats – a tiny little bit to the Left of the Tories (plus some nasty petty nationalism and racism no doubt added in) , but always personally and organisationally “available for hire” to big corporate interests. A split (which now seems inevitable) would be much more successful for the Left if we took the Labour “brand” with us. But at the end of the day it is the continuing link with the Trades union movement which is vital if a serious anti austerity Left (Keynsian) reformist party is to emerge on any scale from this debacle initiated entirely by the Blairite plotters and their backers. Len and other TU leaders seem resolute so far . Long may this be so. Without the continuing organic link with the TU movement there can be no serious Left Party in the UK,.. I am not a die-in-the-wool Corbyn fan, but I find the actions of the PLP offend the principles of natural justice.I cannot imagine an action to keep the incumbent off a ballot would succeed. What the PLP might do is use the Standing Orders of the House to put Angela Eagle forward as the Leader of the opposition. There is no requirement in those rules for it to be the elected leader of the opposition party.The Speaker is the final arbiter.It is unprecedented territory. Perhaps that’s what was happening during the week. Research, and informal soundings with the Speaker. Let’s not rush ahead of ourselves guys. Yes, we can expect procedural moves and dirty tricks from those who want to stop Corbyn, in fact we’ve been seeing them already in a great many constituencies. But the rulebook gives Corbyn the right to be on the ballot. And that’s a right he can enforce in court. So for now the focus should be on winning the election battle to come. And on arguing that it’s the actions of Benn, Eagle and Watson, not those of Corbyn, which are opening up rifts in the party that will not be healed. I was given to understand that the rules had been so poorly written as actually not to make it clear whether the incumbent is automatically on the ballot. Most people interpret them to mean that he should be (I’ve even heard a court would likely rule this way), but there is sufficient ambiguity to at least cause a hassle. Feel free to correct me if I’m wrong on any count here. It’s also commonly stressed that the clear intention of the authors was that the leader would automatically be on the ballot. The root of the problem, then, could be the same old issue of people in positions of power being unwilling to let others in – the authors clearly weren’t up to the job but the idea of listening to mere ordinary members (the ones who would become active in the imaginary ‘new kind of politics’) is simply alien to the orthodox activist mindset. The most compelling interpretation is that ‘”any” nomination’ refers to “nominations [which] may be sought be potential challengers”. This is not only the most convincing literal interpretation: it is also, as John Walsh suggests, the interpretation which matches the intention of the provision as a whole. A Corbyn-hostile barrister gave little doubt that sitting leader Corbyn would be on the ballot in any future contest last December – http://labourlist.org/2016/07/labour-prepares-for-leadership-contest-as-crisis-talk-break-down/ – however perhaps the biggest clue that the coup plotters think this too is the fact that they have been attempting to bully him into resigning for the past 2 weeks and prior to any of them formally starting the nomination process, and which only makes sense in this context given the negative and counter-productive impact it has on them among the membership (in fact on the latter aspect it is due to the bullying that the leading councilor in my area who last year organised support for Cooper has now publicly come out in support of Jeremy due to the widespread disgust at how he has been treated). Talk of a left splinter party is premature. A breakaway party of the left or of the right is unlikely to make any headway (a la the ILP, Democratic Labour, Scottish Labour, and of course the SDP). The immediate focus should be of getting Watson back to the table, otherwise be prepared for another election. So we have the non left wing democratic socialist 174 Labour MPs who have no confidence in JC and many, many members who have no confidence in the 174. The solution is simple if JC is kept off the ballot paper members need to immediatley deselect the 174. We then replace them with 174 decent diverse working class and progressive middle class men and women left wing democratic socialists and I have witnessed so many talented people out there in recent Momentum Pro-Corbyn rallies and meetings! We will then have left wing democratic socialist MPs and left wing democratic socialist members united. Many Labour MPs are there because they played the bourgeois game, wheeling and dealing, backslapping, back me on this and I will back you on that etc. crap whilst left wing democratic socialists should say support me because these are the ideas I believe in. Take Andy Burnham as a case study; a decent man, he probably played the greasy palm game etc. to get where he is but learnt something when he was booed by the Hillsborough families, he then learnt to listen and work in partnership with the families and perhaps this may explain his current position. So Andy and others could free themselves as human beings too by thinking more critically and junking the bourgeois crap; you only have one life, stand for what you believe in! So the Right Wing and some who should know better become prisoners as human beings of saying what they think the public wants to hear rather than what they honestly believe in and I actually pity them. The reference in another post from me to a line in the Bob Dylan song “I was so much older then, I’m younger now” was a reference to me, when I joined Labour; they tried to inculcate me into playing the game (which I am afraid some members fall for too) but as a working class kid from poverty I felt uncomfortable, and in my twenties I had too much of a passion for socialist ideas (but with much to learn) but the pressure was to conform and junk your dreams. “I’m younger now” part to me through the movement around JC has reinvigorated this passion. We can only deselect if the unions stay with us as I understand it. Any way we can force the Unions to stay the course? Surely that’s a job for union members? Yes Richard, the unions are key to local deselection attempts but not always seen as such by activists. When we attempted to deselect our sitting MP a few years ago (pre-Corbyn era) the majority of ward branches voted for a selection (it is done by delegate votes not OMOV), however the majority of local affiliated union branches (in particular Unison) voted the other way as did things like the Coop Party who is moribund in terms of not having local meetings and did not canvas its members but voted for the MP anyway, so it is a hard battle that needs some thought and organisation each time it is attempted as it can be demoralising when you lose! Thanks James. It’s practical advice I think we all need in a battle, not posturing. So it seems the battle must be to hold the unions to their rhetoric should Corbyn be kept from the ballot. How does it work with local affiliated delegates in a deselection debate, are they mandated by the centre or do local delegates make the call? Reading the press, Corbyn has been to a number of union conferences and getting a lot of support from delegates. My guess is this is forcing the leaders toward Corbyn even if they have personal political differences. For example, though McCluskeys statement yesterday was strong it is yet to translate into action. 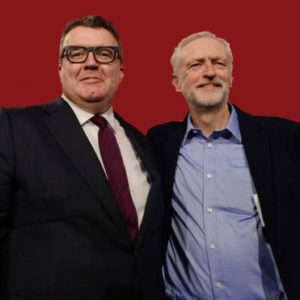 For all I know Watson was told by McCluskey that he has the support of union delegates on the NEC to keep Corbyn from the ballot paper and they agreed they have to move now before the NEC elections this month. Never has the manta organise been as true as now. If austerity is pushing working people on the move, and I have a feeling it is, we will save them a great deal of pain if they are able to move through the Labour Party rather than search around for a grouping that represents them. In terms of union CLP delegates and their mandate it depends on both the union and the situation. In our case the other year I doubt things went much beyond whether branch or local regional official level in terms of how those affiliated union delegates voted on the trigger ballot, but in a wider nationally important time like this then I suspect things would be taken higher than that. Where we have unions with branch independence from the full time officials then it is important to look at how and when those branches discuss the issue, and it is perfectly possibly if there are no internal contacts in the branch for a local momentum group (for example) to ask for an invite to a union branch meeting. More generally affiliated union members who are Corbyn supporters need to be writing now to branch secs, regional officers/officials and to NEC members/GS’s urging them to stand firm. I would also add that it is worthwhile left activists registering with the likes of YouGov as I am regularly getting asked by them my opinion of Corbyn as a GMB member right now, clearly with a hope that figures can be got that would show a lack of support for him in the unions – if left activists ignore these type of things then a misleading picture will be spun by the media and right-wing within the Party to undermine Jeremy. James, you’re a star, thanks for the advice. The murky waters that are Labour Party rules are filled with mines and we need the experience of those that have negotiated them so that our learning curve is rapid if they manage to keep Corbyn from the ballot. As I said above, McTernan predicted the left would split off, no doubt anticipating that Corbyn would not get on to the ballot, but for various reasons we cannot go without a fight. That being the case we need to fight cleverly and that requires knowledge, skill, experience and so on. Are there websites or places we can go where is is discussed regularly? I have looked but find myself asking questions on here in search of sound and useful advice. Yes we need a alliance between the diverse black and white working class, the progressive middle class, AND crucially the trades unions who are probably the greatest organic link to working people. And remember many of us were the first working class kids in our families to go to university when it was free thanks to our forefathers and mothers and we understand what the poor etc. are going through and will never desert them. THEN THE CANARY TURNED BACK INTO A LION. As a life long Labour supporter, a guy who won money of Jeremy winning the leadership and won money of the Brexit even though I voted to remain I have to say Jeremy is not a leader, he is a moaner! In the real world people do not take him or his 1968 revolutionary chic serious. It may make sense in the champagne cocktail parties of Islington but in the wastelands of the Midlands he is a joke. His leadership does not inspire. His demonstrations about his ‘mandate’ is not motivational, its just boring. If he had any sense he would prepare someone else to be the leader. Leadership is all about consistency and legacy. At the moment his legacy will be the destruction of Labour as a serious force. That maybe OK for the plastic revolutionaries of Momentum and SWP but in the real world it will be a disaster with UKIP or their equivalent grabbing the natural working class Labour supporters. The natural Labour supporters are being seduced by Jeremy Kyle and EDL. Why else would the elites put them on TV constantly and eulogies neo-fascist activity. Extremist Islamist do make it easy but we need a secular Labour party to cut through the nonsense and get back to building a genuine working class movement to give a clear left of centre analysis not mess about with rubbish leadership and empty protest politics. If Labour go down the road of backing Jeremy Corbyn and his juvenile Momentum nonsense then they will deserve the loss of power and the implosion of the best hope for a genuine peoples party. This absurd challenge by neo-liberal New Labour MPs to the leadership of Corbyn is just another Remain hissy fit by those whose privileged existence and unshakable sense of entitlement to it has been sorely disturbed by the Brexit vote. First we must see off the coup plotters by re-electing Corbyn with a big mandate. Then we must act like a general election is immanent and put forward a radical socialist response to dead capitalism’s programme of asset stripping and liquidation of the real economy. Finally we must de-select the coup plotters in every constituency as it is clear that they will refuse to form a Corbyn Labour government if Labour won a general election but would bloc with Lib Dems and Tories to keep austerity going. Where they cannot be de-selected candidates should stand against them who are willing to support the formation of a Corbyn government.